The Mongol Empire developed in the course of the 13th century through a series of victorious campaigns throughout Asia, reaching Eastern Europe by the 1240s. In contrast with later "empires of the sea" such as the British, the Mongol empire was a land power, fueled by the grass-foraging Mongol cavalry and cattle. Thus most Mongol conquest and plundering took place during the warmer seasons, when there was sufficient grazing for the herds. Though the Mongol Empire began to fragment from 1260, Tartar and Mongol threats to the Russian states continued for centuries. Mongols continued to rule China into the 14th century under the Yuan dynasty, while Mongol rule in Persia persisted into the 15th century under the Timurid Empire. In India, the later Mughal Empire survived into the 19th century. Battle of Vâliyân against the Khwarazmian dynasty. Genghis Khan forged the initial Mongol Empire in Central Asia, starting with the unification of the Mongol and Turkic confederations such as Merkits, Tartars, and Mongols. The Uighur Buddhist Qocho Kingdom surrendered and joined the empire. He then continued expansion via conquest of the Qara Khitai and the Khwarazmian dynasty. Against the Alans and the Cumans (Kipchaks), the Mongols used divide-and-conquer tactics by first warning the Cumans to end their support of the Alans, whom they then defeated. before rounding on the Cumans. Alans were recruited into the Mongol forces with one unit called "Right Alan Guard" which was combined with "recently surrendered" soldiers. Mongols and Chinese soldiers stationed in the area of the former Kingdom of Qocho and in Besh Balikh established a Chinese military colony led by Chinese general Qi Kongzhi (Ch'i Kung-chih). 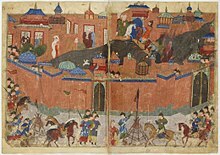 During the Mongol attack on the Mamluks in the Middle East, most of the Mamluk military was composed of Kipchaks, and the Golden Horde's supply of Kipchak fighters replenished the Mamluk armies and helped them fight off the Mongols. Hungary became a refuge for fleeing Cumans. The decentralized, stateless Kipchaks only converted to Islam after the Mongol conquest, unlike the centralized Karakhanid entity comprising the Yaghma, Qarluqs, and Oghuz who converted earlier to world religions. The Mongol conquest of the Kipchaks led to a merged society with a Mongol ruling class over a Kipchak-speaking populace which came to be known as Tatar, and which eventually absorbed Armenians, Italians, Greeks, and Goths on the Crimean peninsula to form the modern day Crimean Tatar people. The Mongols conquered, by battle or voluntary surrender, the areas of present-day Iran, Iraq, the Caucasus, and parts of Syria and Turkey, with further Mongol raids reaching southwards into Palestine as far as Gaza in 1260 and 1300. 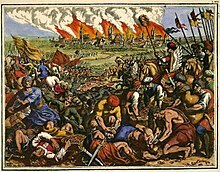 The major battles were the Siege of Baghdad (1258), when the Mongols sacked the city which had been the center of Islamic power for 500 years, and the Battle of Ain Jalut in 1260, when the Muslim Kipchak Mamluks were able to defeat the Mongols in the battle at Ain Jalut in the southern part of the Galilee—the first time the Mongols had been decisively stopped. One thousand northern Chinese engineer squads accompanied the Mongol Khan Hulagu during his conquest of the Middle East. Mongol Empire's conquest of Chinese regimes including Western Liao, Jurchen Jin, Song, Western Xia and Dali kingdoms. Genghis Khan and his descendants launched progressive invasions of China, subjugating the Western Xia in 1209 before destroying them in 1227, defeating the Jin dynasty in 1234 and defeating the Song dynasty in 1279. They made the Kingdom of Dali into a vassal state in 1253 after the Dali King Duan Xingzhi defected to the Mongols and helped them conquer the rest of Yunnan, forced Korea to capitulate through invasions, but failed in their attempts to invade Japan, their fleets scattered by kamikaze storms. The Mongols' greatest triumph was when Kublai Khan established the Yuan dynasty in China in 1271. The dynasty created a "Han Army" (漢軍) out of defected Jin troops and an army of defected Song troops called the "Newly Submitted Army" (新附軍). The Mongol force which invaded southern China was far greater than the force they sent to invade the Middle East in 1256. The Yuan dynasty established the top-level government agency Bureau of Buddhist and Tibetan Affairs to govern Tibet, which was conquered by the Mongols and put under Yuan rule. The Mongols also invaded Sakhalin Island between 1264 and 1308. Likewise, Korea (Goryeo) became a semi-autonomous vassal state of the Yuan dynasty for about 80 years. The Yuan dynasty was eventually overthrown during the Red Turban Rebellion in 1368, which restored Han Chinese rule in the Ming dynasty. 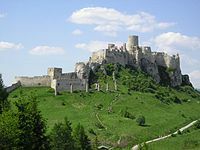 The Mongol invasion in the 13th century led to construction of mighty stone castles, such as Spiš Castle in Slovakia. The Mongols invaded and destroyed Volga Bulgaria and Kievan Rus', before invading Poland, Hungary, Bulgaria, and other territories. Over the course of three years (1237–1240), the Mongols razed all the major cities of Russia with the exceptions of Novgorod and Pskov. They [the Mongols] attacked Rus, where they made great havoc, destroying cities and fortresses and slaughtering men; and they laid siege to Kiev, the capital of Rus; after they had besieged the city for a long time, they took it and put the inhabitants to death. When we were journeying through that land we came across countless skulls and bones of dead men lying about on the ground. Kiev had been a very large and thickly populated town, but now it has been reduced almost to nothing, for there are at the present time scarce two hundred houses there and the inhabitants are kept in complete slavery. The Mongol invasions displaced populations on a scale never seen before in central Asia or eastern Europe. Word of the Mongol hordes' approach spread terror and panic. From 1221 to 1327, the Mongol Empire launched several invasions into the Indian subcontinent. The Mongols occupied parts of modern Pakistan and other parts of Punjab for decades. However, they failed to penetrate past the outskirts of Delhi and were repelled from the interior of India. Centuries later, the Mughal Empire, with Mongol roots from Central Asia, conquered the northern part of the sub-continent. The Battle of Bạch Đằng against Vietnam. Kublai Khan's Yuan dynasty invaded Burma between 1277 and 1287, resulting in the capitulation and disintegration of the Pagan Kingdom. However, the invasion of 1301 was repulsed by the Burmese Myinsaing Kingdom. The Mongol invasions of Vietnam (Đại Việt) and Java resulted in defeat for the Mongols, although much of Southeast Asia agreed to pay tribute to avoid further bloodshed. Due to the lack of contemporary records, estimates of the violence associated with the the Mongol conquests vary considerably. Not including the mortality from the Plague in Europe, West Asia, or China it is possible that between 20 and 40 million people were killed between 1206 and 1405 during the various campaigns of Genghis Khan, Kublai Khan, and Timur. The havoc included battles, sieges, early biological warfare, and massacres. ^ "What Was the Deadliest War in History?". WorldAtlas. Retrieved 2019-02-04. ^ White, M. (2011). Atrocities: The 100 deadliest episodes in human history. WW Norton & Company. p270. ^ Compare: Barras, Vincent; Greub, Gilbert (June 2014). "History of biological warfare and bioterrorism". Clinical Microbiology and Infection. 20 (6): 498. doi:10.1111/1469-0691.12706. PMID 24894605. In the Middle Ages, a famous although controversial example is offered by the siege of Caffa (now Feodossia in Ukraine/Crimea), a Genovese outpost on the Black Sea coast, by the Mongols. In 1346, the attacking army experienced an epidemic of bubonic plague. The Italian chronicler Gabriele de’ Mussi, in his Istoria de Morbo sive Mortalitate quae fuit Anno Domini 1348, describes quite plausibly how the plague was transmitted by the Mongols by throwing diseased cadavers with catapults into the besieged city, and how ships transporting Genovese soldiers, fleas and rats fleeing from there brought it to the Mediterranean ports. Given the highly complex epidemiology of plague, this interpretation of the Black Death (which might have killed > 25 million people in the following years throughout Europe) as stemming from a specific and localized origin of the Black Death remains controversial. Similarly, it remains doubtful whether the effect of throwing infected cadavers could have been the sole cause of the outburst of an epidemic in the besieged city. ^ Andrew G. Robertson, and Laura J. Robertson. "From asps to allegations: biological warfare in history," Military medicine (1995) 160#8 pp. 369–73. ^ a b |Invaders|The New Yorker "Of necessity, the Mongols did most of their conquering and plundering during the warmer seasons, when there was sufficient grass for their herds. [...] Fuelled by grass, the Mongol empire could be described as solar-powered; it was an empire of the land. Later empires, such as the British, moved by ship and were wind-powered, empires of the sea. The American empire, if it is an empire, runs on oil and is an empire of the air. ^ Sinor, Denis. 1995. “Western Information on the Kitans and Some Related Questions”. Journal of the American Oriental Society 115 (2). American Oriental Society: 262–69. doi:10.2307/604669. ^ "Central Asian world cities Archived 2012-01-18 at the Wayback Machine", University of Washington. ^ Halperin, Charles J.. 2000. “The Kipchak Connection: The Ilkhans, the Mamluks and Ayn Jalut”. Bulletin of the School of Oriental and African Studies, University of London 63 (2). Cambridge University Press: Archived 2017-03-27 at the Wayback Machine p. 235. ^ Sinor, Denis. 1999. “The Mongols in the West”. Journal of Asian History 33 (1). Harrassowitz Verlag: 1–44. https://www.jstor.org/stable/41933117 Archived 2017-03-27 at the Wayback Machine. ^ Morris Rossabi (1983). China Among Equals: The Middle Kingdom and Its Neighbors, 10th–14th Centuries. University of California Press. pp. 255–. ISBN 978-0-520-04562-0. ^ Halperin, Charles J.. 2000. “The Kipchak Connection: The Ilkhans, the Mamluks and Ayn Jalut”. Bulletin of the School of Oriental and African Studies, University of London 63 (2). Cambridge University Press: 229–45. https://www.jstor.org/stable/1559539 Archived 2017-03-27 at the Wayback Machine. ^ Howorth, H. H.. 1870. “On the Westerly Drifting of Nomades, from the Fifth to the Nineteenth Century. Part III. The Comans and Petchenegs”. The Journal of the Ethnological Society of London (1869–1870) 2 (1). [Royal Anthropological Institute of Great Britain and Ireland, Wiley]: 83–95. https://www.jstor.org/stable/3014440. ^ Golden, Peter B.. 1998. “Religion Among the Q1pčaqs of Medieval Eurasia”. Central Asiatic Journal 42 (2). Harrassowitz Verlag: 180–237. https://www.jstor.org/stable/41928154. ^ Williams, Brian Glyn. 2001. “The Ethnogenesis of the Crimean Tatars. An Historical Reinterpretation”. Journal of the Royal Asiatic Society 11 (3). Cambridge University Press: 329–48. https://www.jstor.org/stable/25188176 Archived 2016-12-27 at the Wayback Machine. ^ Josef W. Meri, Jere L. Bacharach, ed. (2006). Medieval Islamic Civilization: An Encyclopedia, Vol. II, L–Z, index. Routledge. p. 510. ISBN 978-0-415-96690-0. Retrieved 2011-11-28. This called for the employment of engineers to engaged in mining operations, to build siege engines and artillery, and to concoct and use incendiary and explosive devices. For instance, Hulagu, who led Mongol forces into the Middle East during the second wave of the invasions in 1250, had with him a thousand squads of engineers, evidently of north Chinese (or perhaps Khitan) provenance. ^ Smith, Jr. 1998 Archived 2017-02-02 at the Wayback Machine, p. 54. ^ "BBC Russia Timeline". BBC News. Archived from the original on 2018-03-18. Retrieved 2018-03-31. ^ Diana Lary (2012). Chinese Migrations: The Movement of People, Goods, and Ideas over Four Millennia. Rowman & Littlefield. p. 49. ISBN 9780742567658. ^ Taylor 2013, pp. 103, 120. ^ ed. Hall 2008 Archived 2016-10-22 at Archive.today, p. 159. ^ Werner, Jayne; Whitmore, John K.; Dutton, George (21 August 2012). Sources of Vietnamese Tradition. Columbia University Press. ISBN 9780231511100 – via Google Books. ^ Gunn 2011, p. 112. ^ Embree, Ainslie Thomas; Lewis, Robin Jeanne (1 January 1988). "Encyclopedia of Asian history". Scribner – via Google Books. ^ "Twentieth Century Atlas – Historical Body Count". necrometrics.com. Retrieved 2019-02-04. ^ Angus, M. (1998). Development Centre studies Chinese economic performance in the long run. OECD publishing. ^ McEvedy, Colin; Jones, Richard M. (1978). Atlas of World Population History. New York, NY: Puffin. p. 172. ISBN 9780140510768. ^ "Mongol Siege of Kaifeng | Summary". Encyclopedia Britannica. Retrieved 2019-02-04. ^ Wheelis M. Biological Warfare at the 1346 Siege of Caffa. Emerging Infectious Diseases. 2002;8(9):971–975. doi:10.3201/eid0809.010536. ^ Morgan, D. O. (1979). The Mongol Armies in Persia. Der Islam, 56(1), 81–96. ^ Halperin, C. J. (1987). Russia and the Golden Horde: the Mongol impact on medieval Russian history (Vol. 445). Indiana University Press. Wikimedia Commons has media related to Mongol conquests.